Network Topology is the schematic description of a network arrangement, connecting various nodes(sender and receiver) through lines of connection. Bus topology is a network type in which every computer and network device is connected to single cable. When it has exactly two endpoints, then it is called Linear Bus topology. It transmits data only in one direction. Cable required is least compared to other network topology. Easy to expand joining two cables together. Cables fails then whole network fails. If network traffic is heavy or nodes are more the performance of the network decreases. Cable has a limited length. It is slower than the ring topology. 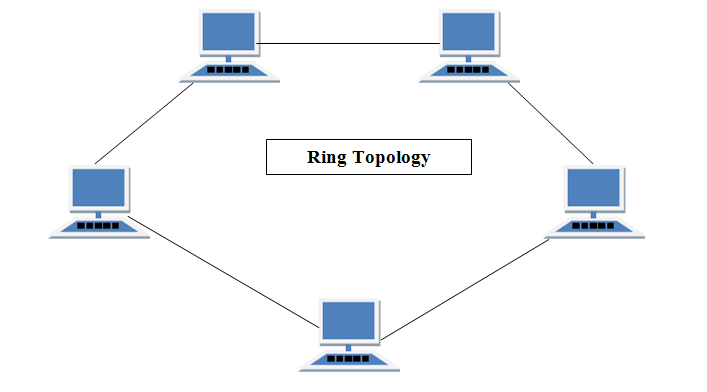 It is called ring topology because it forms a ring as each computer is connected to another computer, with the last one connected to the first. Exactly two neighbours for each device. A number of repeaters are used for Ring topology with large number of nodes, because if someone wants to send some data to the last node in the ring topology with 100 nodes, then the data will have to pass through 99 nodes to reach the 100th node. Hence to prevent data loss repeaters are used in the network. 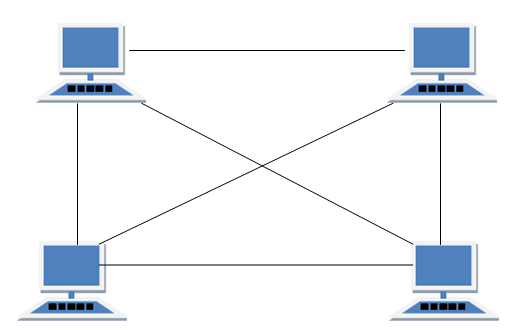 The transmission is unidirectional, but it can be made bidirectional by having 2 connections between each Network Node, it is called Dual Ring Topology. In Dual Ring Topology, two ring networks are formed, and data flow is in opposite direction in them. Also, if one ring fails, the second ring can act as a backup, to keep the network up. Data is transferred in a sequential manner that is bit by bit. Data transmitted, has to pass through each node of the network, till the destination node. Transmitting network is not affected by high traffic or by adding more nodes, as only the nodes having tokens can transmit data. Troubleshooting is difficult in ring topology. Adding or deleting the computers disturbs the network activity. Failure of one computer disturbs the whole network. In this type of topology all the computers are connected to a single hub through a cable. This hub is the central node and all others nodes are connected to the central node. Every node has its own dedicated connection to the hub. Hub acts as a repeater for data flow. Can be used with twisted pair, Optical Fibre or coaxial cable. Fast performance with few nodes and low network traffic. Hub can be upgraded easily. Easy to setup and modify. Only that node is affected which has failed, rest of the nodes can work smoothly. Cost of installation is high. 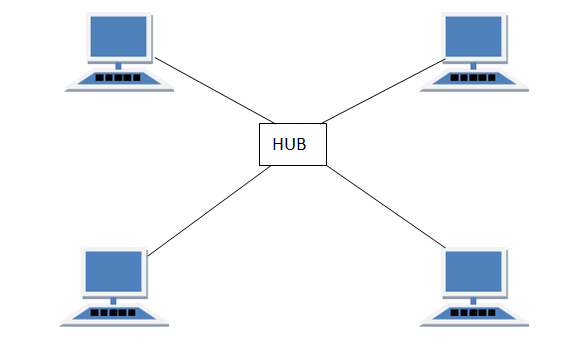 If the hub fails then the whole network is stopped because all the nodes depend on the hub. It is a point-to-point connection to other nodes or devices. All the network nodes are connected to each other. Mesh has n(n-1)/2 physical channels to link n devices. In routing, the nodes have a routing logic, as per the network requirements. Like routing logic to direct the data to reach the destination using the shortest distance. Or, routing logic which has information about the broken links, and it avoids those node etc. We can even have routing logic, to re-configure the failed nodes. In flooding, the same data is transmitted to all the network nodes, hence no routing logic is required. The network is robust, and the its very unlikely to lose the data. But it leads to unwanted load over the network. Partial Mesh Topology : In this topology some of the systems are connected in the same fashion as mesh topology but some devices are only connected to two or three devices. 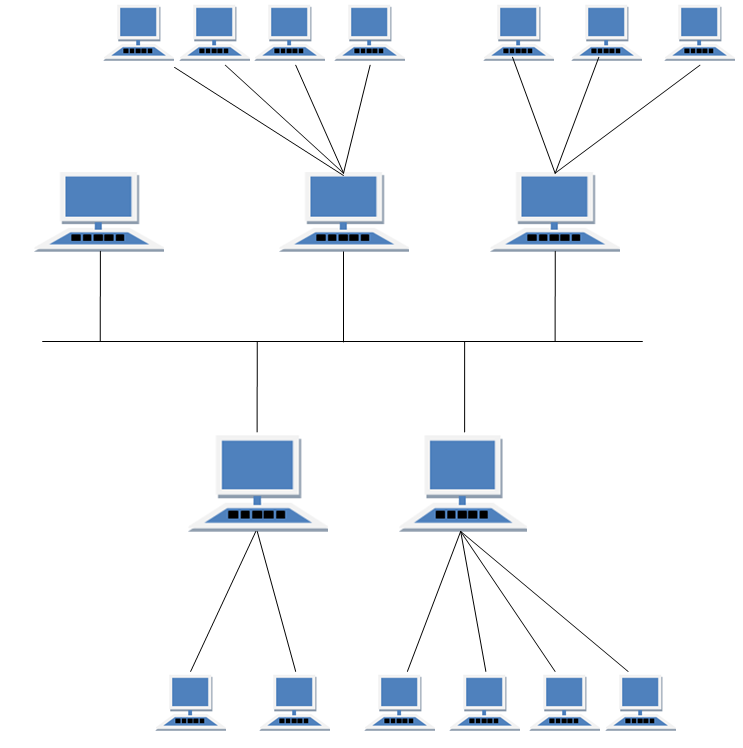 Full Mesh Topology : Each and every nodes or devices are connected to each other. Each connection can carry its own data load. Installation and configuration is difficult. It has a root node and all other nodes are connected to it forming a hierarchy. It is also called hierarchical topology. It should at least have three levels to the hierarchy. Ideal if workstations are located in groups. Used in Wide Area Network. Extension of bus and star topologies. Expansion of nodes is possible and easy. Error detection is easily done. If more nodes are added maintenance is difficult. Central hub fails, network fails. It is two different types of topologies which is a mixture of two or more topologies. For example if in an office in one department ring topology is used and in another star topology is used, connecting these topologies will result in Hybrid Topology (ring topology and star topology). Reliable as Error detecting and trouble shooting is easy. Scalable as size can be increased easily.